I hope you are all keeping warm now that Winter has really set in, grab a jacket, grab a blanket or just grab your sweetie cuz Baby, it's cold outside. Now with Christmas right around the corner, I'd like to do something a little different in this newsletter. I'd love to hear from YOU. So tell me "What's your favorite Christmas tradition?" Email me at caeperformance@aol.com and I'll include them in my Dec 22nd newsletter. My favorite tradition was when my kids were younger on Christmas Eve, after dark, we would bundle up, grab at hot drink at Starbucks and drive to this one neighborhood in Chino where every house for blocks was decorated with tons of lights. We would drive through some of it, but the most fun was when I parked the car and we all got out and walked around. Afterward we would go out to dinner and then get home so the kids could get to bed before Santa came. Even though my kids are grown, married and now expecting kids of their own, I know that that tradition has stuck with them and they continue it on still. Now, tell me yours. Due to Christmas there are no local shows coming up, but if you are having an event or know of one and you'd like to have me get the word out, please email me with all of the details. You can also check out our website for a full list of all upcoming events for the month. I would also like to be able to get more local Car Clubs profiled on our website. 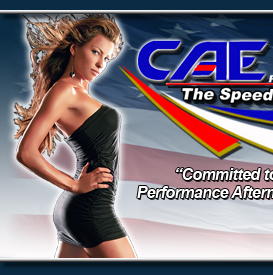 So if you are in a club or run one and would like to be listed on our CLUBS page on our website, www.caeperformance.com, email me and I'll get you up there. Also, if you'd like to get any updates on events and shows you can become our FRIEND on facebook, you can search for Tamie Red and send me a request. I hope you all enjoy this new format to my newsletter and I would love your feedback.